The momentum of your swing should automatically force you to follow-through. 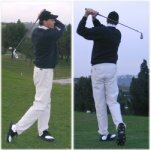 Finish your swing in a balanced, upright position with almost all of your weight on your left foot. The front of your body should face the target and the club should be over your left shoulder and behind you.